For the past decades, huge man-made landscapes have become characterized by a static image of commodity that can only be recognized from a satellite view, like the popular Google Earth or the NASA World Wind. 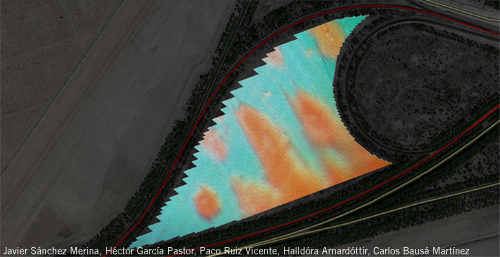 This proposal addresses the notion of landscape as communication of human activities. It is a project that instigates a dynamic look: A person participating in the landscape should be prepared to interact with it. Hence we suggest a change in the observer’s standing point, a change to recognize a new indicator of time and scale in relation to the site and the earth in a worldwide context. This communication can be appreciated around the world and people are invited to interact with its message. Although an activity occupied only by 1m2, it would achive a global scale and multiply its audience. 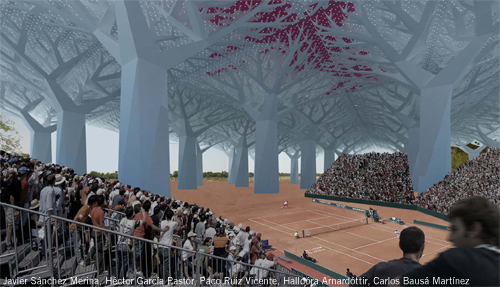 However, the change of scale is not only metric but also within its content and ways of transmission: the exciting final of the UAE Open, Federer vs Nadal, played with the CTRUS C1 ball technology, can be followed simultaneously at the place and on satellite as a tennis strategy board; the lecture STRANDBEEST at TED will be a walk accompanying Theo Jansen’s works while the landscape becomes a text; a concert would transform the site into a festival of colours. New geographic information programmes will evolve and show life on-line, not merely static images of past events. The aim is to have people experience things together, regardless of their location. Arab architecture has been a continuous lesson of modernity, yet now forgotten by many: The space in the Mosque of Córdoba is defined by columns, organised in an abstract mesh that dissolves the concept of axial and limited space. The resulting vistas of columns and arcades create a mysterious space. Echoing this “stone forest”, our inner space is created by 34 structures of Carbon Fibre Composites. An interior landscape of 40m tall columns generates a network relationship and different activities that together give a sense of unity. Organized in staggered formation (80×140m), there is enough space between them to arrange a football pitch. Thus, the landscape can offer several events at the same time. The roof is made of more than 31.000 Sunlight Concentrators. Each concentrator consists of a parabolic dish, 2,5m diameter joined to another following a “Mocarab” pattern. Under this roof, the inner space makes up a landscape of 170.000m2, having the qualities of being fresh, protect from the sun, and with reduced humidity: An ideal surface full of possibilities. The structures’ elevation follows fractal geometry, from the trunk to the concentrators, which enables a maximum coverage to be achieved through the economy of the material and its repetitive construction. Each structure includes: Touch Screens attached to the sides of the trunks, ground level. From the interior, the audience will see the effects of their actions reflected on the inferior side of the roof. Lavatories and storage areas are inside the trunks (rhombus 6,80×6,80m), ground level. A storage water tank is located inside each trunk. Water Atomizers are installed inside the trucks to reduce the temperature by 10ºC. Sensors of movement, light and sound in the “branches” of the structure send the message of change, according to the human activity taking place. The branches incorporate draining system that collects condensed water in the roof to be recycled in the building. The Sunlight Concentrators that build up the multi-pixel landscape of rapidly changing colours can be used as educational facility, drawing people together around the world to learn about the new technology. 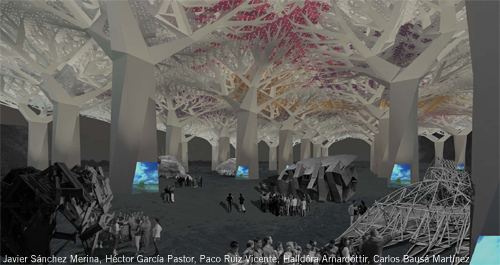 This project is a step into learning from natural mechanisms: the Baobab Tree. The way it recollects water and storages it, its photosynthesis, radiation of heat, distribution of liquids, allowing the wind to pass without frictions, provoking breeze… Our collaboration with a specialist in Ecological Technology has carried out a research on design with the following achievements: Chameleon-like, its surface changes colour: The use of Electrochromic paints permits our Sunlight Concentrators to change colour. Opalux Inc. offers us their electrically activated technology that, based on the diversity of colours offered by the opal stone, utilizes structured photonic crystals to produce devices that can be electrically tuned to reflect any colour in the visible, UV, or IR spectrum. When a voltage is applied, the active polymer increases or decreases in size, and this dimensional change will shift the frequencies of light that are reflected from the material. In this way the concentrators can reflect any colour in the visible spectrum, depending on the voltage applied, being in any case very low power requirements (<1,5 Volts, microamp currents). Leave-like, its crown transforms sun light into energy: By concentrating sunlight onto a small area of high-efficiency solar cell material, SolFocus Inc. systems dramatically reduce the amount of expensive and often supply-constrained solar material used in the system. Our collaboration has developed towards providing high-energy output and maximum energy production per area of land. The results of 31.492 Sunlight Concentrators with parabolic shape of 2,5m diameter are enough to provide power to 6.220 homes in the UAE. The energy consumption in the production of SolFocus CPV systems is the lowest of all solar technologies, reaching only 22gCO2eq/kWh. In terms of Water Consumption, SolFocus CPV systems do not consume water in the electricity generation process because they are passively cooled; water is only used for panel cleaning, a water that will proceed from condensation. Cactus-like, its appendixes provoke condensation: Due to the high relative humidity, the dew point is close to the current air temperature. At night, the parabolic dishes will act as cold spines that collect the condensation water in both of their sides. Although the rainfall in Abu Dhabi is very small, it is important also to collect and store the water of the few rainy days along the year. Flat Bones-like, its skin gets reinforced. Composite provides “green” alternative to traditional building materials. The total life cycle assessment of composite material can place it above traditional products, under green building initiatives in Energy and Environmental Design. When the amount of energy consumed to produce, install and maintain a composite structure is taken into consideration, it uses far less than other traditional materials. The lightweight composite as a building material contributes to overall savings due to lower transportation costs, faster construction, less dead weight requiring smaller and lighter building structural requirements, and lighter lifting equipment. It is also resistant to rust, rot and corrosion. By doubling the useful lifespan compared to other products, composite’s durability reduces the need for replacement, repair or repainting; it is a low conductor of heat, fire-retardant, virtually maintenance free, and the strongest material available per unit of weight.